This Classic Heart with Left Ventricular Hypertrophy (LVH) 2 part by 3B Scientific is a unique heart model which is slightly smaller than a life-size heart. It shows the long-term effects of increased heart activity due to high blood pressure. The muscular wall of the left heart ventricle is considerably thickened and the tip of the heart is visibly rounded off for detailed examination. 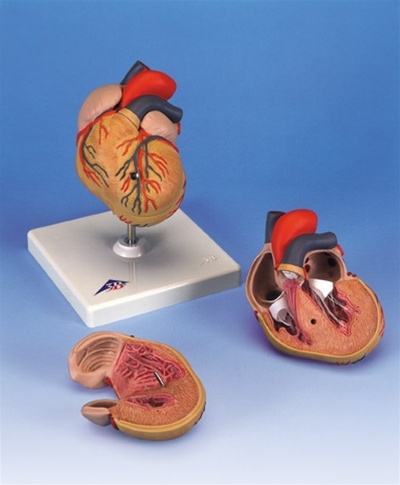 It is a highly detailed heart model with exquisite anatomical detail that can be disassemble into two parts for effective demonstration. The heart wall is detachable for viewing of the chambers and valves on the inside. This product also includes a mounted stand for display. This model is perfect for educational aids in the medical field, scientific classrooms and homeschool-based projects. Highly Recommended for medical professionals such as; doctors, medical professors, and medical students. • WELL-MADE Product- This product is made by 3B Scientific one of the best manufacturers of anatomical models in Germany which is known for making above-average quality of products and is recognized all over the world.